Great-Grandparents Jane and John Mabey, with Great-Aunt Ursie peeping over the hedge. In 1941, when my Grandfather turned 52, it was my Great-Grandmother alone who sent him birthday wishes, for my Grandfather’s Dear Old Dad had passed away the summer before. She signs off with the lines quoted above, which reminded me of something my Mother said about herself and my Dad – that over the years they ‘really did become as one’. They nearly got to 60 years together, my Mum and Dad. Such a long-lived union I won’t experience myself, but it seems that my Great-Grandparents certainly did. This is the last birthday wish I have in The Letters; Great-Grandmother died in 1944, so it seems just chance that this note survived. The ink and paper are so fresh and clean, the letter could have been written last month. Dear John, I must write a line specially for yourself on the occasion of your birthday. I wish I could do it with a lighter heart – but the distressing times we are living in are against it. I can only wish and hope that in the near future the dark cloud of war may have passed away and the sunshine of peace and good will may shine for you and yours. You can look back with satisfaction on the years that have passed. you have been a good son, husband and father and I pray God that the years to come will bring joy and happiness to you and yours. The war has prevented me from giving my usual gift of chocolate but I know that you value more my love and good wishes. Your Dad would endorse all I have said, you must take it as said from him through me. And on the back of the letter, to alleviate the air of melancholy she may have detected in her writing, Great-Grandmother copied out a horoscope to amuse her son. “‘Ware women teachers I spose”, translates as “beware women teachers I suppose” – a little example of Isle of Wight dialect! This little letter, the good quality notepaper and envelope all of a piece, was written and posted on the 27th December 1939. Thank you so much for the pretty Xmas card. Your Aunties were very pleased with theirs especially Auntie Daisy and Norah with their picture of Blackie. I do miss you running about the house but am so glad you are enjoying yourself with your dolls – what a large family of them you must have! I expect Daddy’s holiday is going all too quickly – if you had stayed here another week you would not have been able to go home for Xmas because of the fog – wouldn’t that have been sad? Give my love to Peter and thank him for his letter. Love to Albert too. I hope he is well. Lots of love to your dear little self from Grandma. Auntie Frad will write to you. Auntie Frad stands behind my Mother in this photograph, with Great-Grandmother and my Grandfather. It was taken in the front garden of Headley House, on a spring afternoon I imagine. My Mother is possibly a little younger than eight years old – but it is the only photo I have of them both together. And you would imagine her a rather miserable soul, would you not, from her expression? Thankfully we have her letters and see the sunnier side of her character. There is another tiny photograph of Great-Grandmother cuddling a little cat, perhaps it is Blackie? I shall find that and share it soon. 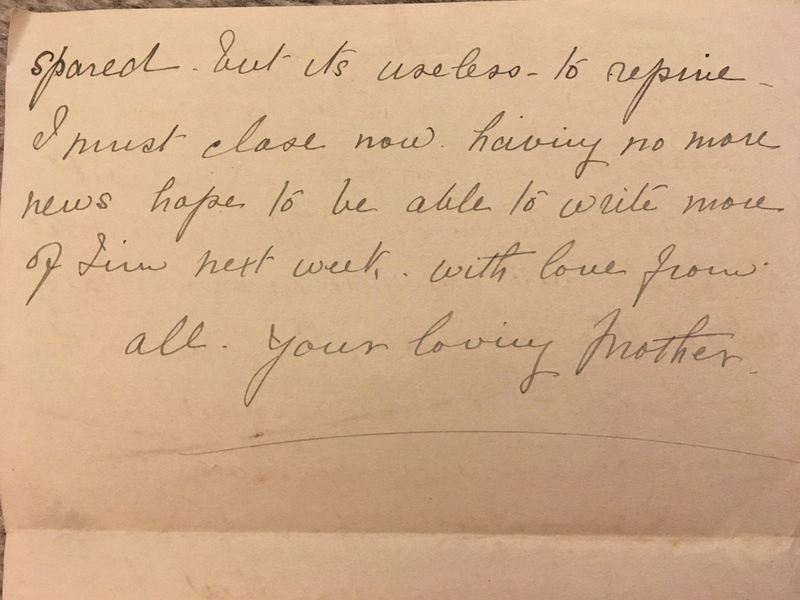 Rereading this note stirred the futile desire to have had a Grandmother myself, to have received such little notes – life-long treasures of family love. I photographed the letter outside in my garden, taken by a strange notion to let the paper and ink feel the warmth of the sun once again. It is my morning habit to make a tour of my garden, which takes no more than five minutes due to its small size. It’s a daily pleasure to watch bees diligently visiting the flowers, to see leaves stirring in the breeze, and simply to be in the sunlight. Recently I moved the original blueberry bush, which Mother and I bought at the nursery she loved. It’s in a better spot now. We only managed to get one, there being just a single variety on sale. She told me we should find another type, otherwise the flowers could not pollinate and there would be no fruit. That was in the summer. We had no further opportunity before autumn came. “You had better take it” she said in October. 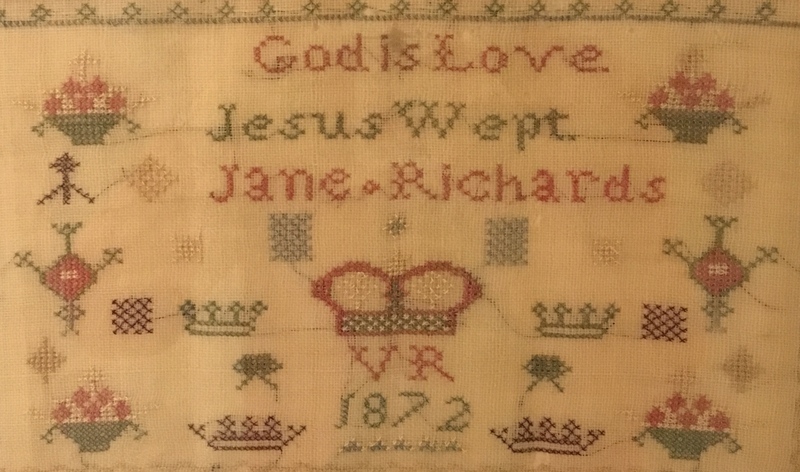 “You had better take it, for now.” I remember catching her eye and we silently acknowledged the falsehood of ‘for now.’ My Mother died two weeks later. So I took the blueberry bush and I bought another. My Mother was right, of course, and I have been eating blueberries from my garden every morning, in this hottest of English summers.